The New Order has its share of enemies. No one ought to consider himself an enemy of the Order, but there's no accounting for taste. Some enemies are new; some are old. Among the rebels who know the New Order's history, the name Arctic Dungeon sends a chill down their spine. Hesperaa and her corp have been allies of the New Order since the beginning. They are known for their enjoyment of wardecs, but not for their mercy. Hesperaa informed me that Neltharak Idrissil, one of the first New Order Agents, had placed a spy within an alliance of carebears known as Another Space. The carebears set up shop within a wormhole. No big deal, right? The New Order governs highsec, not wormsec. But Neltharak is an old hand at the intel game, and he quickly realized that something wasn't right. He suspected that Another Space alliance might have ties to highsec criminals, and that they might try to use the wormhole as a safe haven from which to launch future acts of bot-aspirancy. Armed with his suspicions and his authority to root out evil wherever it may be, Neltharak contacted comrades in Arctic Dungeon, Hesperaa and VolkenCDiskenth, along with Agent John XIII. Together, they discovered a small fleet of Another Space battlecruisers, which were in a wormhole attacking an offline POS--an act not altogether dissimilar to AFK mining. Though outnumbered, Agents of the New Order fear nothing. The Agents attacked using a Loki, Proteus, Pilgrim, and Jaguar. The rebels were taken completely by surprise, and were wiped out. Our heroes suffered no losses. Being men and women of honour, the New Order Agents offered to accept a surrender from Another Space, should they remit a suitable payment. The carebears refused. Later, Neltharak's spy in the alliance used his roles to empty an Another Space POS ship hangar, stealing battlecruisers and several industrial vessels. Another Space still refused to surrender. Arctic Dungeon declared war. 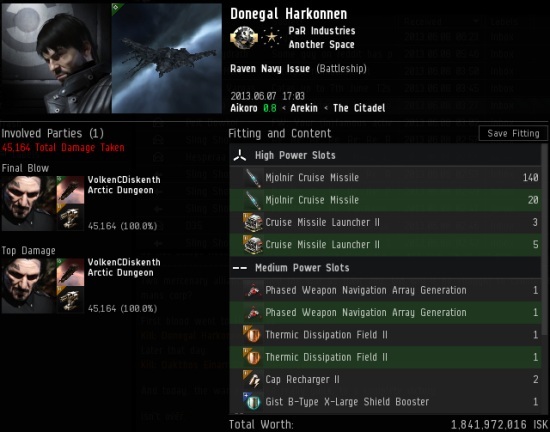 Shortly after the wardec went live, VolkenCDiskenth destroyed a hostile Retriever, which was mining without a license in highsec. Neltharak's instincts had not failed him; the Another Space alliance was indeed harboring Code violators. This is why we grant Agents of the New Order such wide discretion. The next day, VolkenCDiskenth was on a highsec patrol and discovered Donegal Harkonnen wandering around aimlessly in a 1.8 billion isk Raven Navy Issue. Despite having ample opportunity to repent, Donegal made the choice to persist in carebearing. Outraged, VokenCDiskenth charged into battle with a Hurricane Fleet Issue and slew the beast. The world is complicated. It is painted in shades of gray. But the New Order brings clarity. 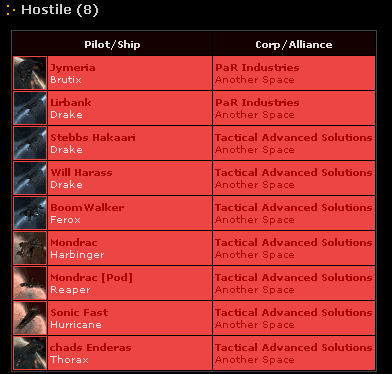 Everything in highsec is either black or white: You're either one of the good guys or one of the bad guys. The New Order makes no distinction between the Code violators and those who harbor them. Another Space thought they could get away with it. They were wrong. 1.8B Raven Navy Issue using tech 1 cruise misslies? Oh the horror! 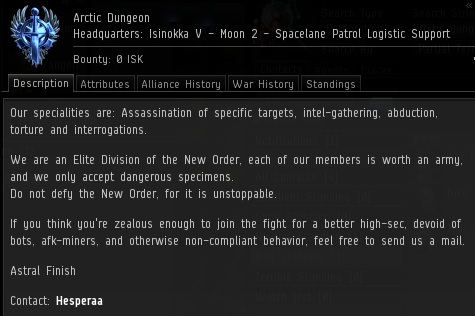 I'm so happy that we finally have the New Order, finally we can get rid of the filth that made High Sec such a bad place to live in all these years. I couldn't stand them anymore, those leeches are like politicians who steal public money from the people. I thank you sincerely. The New Order really lacks any kind of focus doesn't it. As always the New Order keeps finding people to punish it rather reminds me of that speech by Martin Niemöller. Their focus is on punishing highsec code violators... I'd say they're doing pretty well focusing on that. It's so fun when they show up in local, high sec was so boring before with all those silent players who never interacted or responded. Now it's another story! I'd say they're very focused on what they want to achieve. I can't see how someone can dislike the New Order, they're creating fun for players who joined to play a multiplayer game. A lot of people also join EVE because they hear of what James 315 is achieving! It's great! I think that no matter what is posted bobbins will find something to troll about it. that's what trolls do. GLORY TO THE NEW ORDER AND ITS LOYAL ADHERENTS: ARCTIC DUNGEON!!! It's been a long time. A very long time. ...and I shall shed my light over dark evil. The light of The Code of the New Order! "Jack, you've debauched my sloth." Dr Steven Maturin in 'HMS Surprise' by Patrick O'brian, original concept: Martin Niemöller. How long does it take a Navy Raven with 4 faction BCU to kill a faction Cane? Cruise missiles and 2 painters so full DPS application.